Strip the leaves from half the rosemary and chop. Grate the lemon's zest. Mix both into the butter. Season the lamb, smear with the butter and put in a roasting tin large enough to take the lamb and the potatoes. Roast for 20 minutes, then reduce the oven to 200°C, gas mark 6, baste the lamb and roast for 15 minutes per 500g for medium-rare, 20 minutes for medium and 25 minutes for well done. Forty-five minutes before the end of cooking, put the potatoes, remaining rosemary and garlic around the lamb, basting them with the juices. Sprinkle with salt. Quarter the zested lemon and add this, too. When the lamb is cooked, transfer to a warm dish with the potatoes and leave to rest for 10 minutes in a warm place while you make the gravy. Remove the rosemary and lemon from the roasting tin. Skim all but 3 tbsp fat from the tin. Squeeze the garlic cloves out of their skins into the tin. Put the tin over a low heat and add the wine and deglaze the tin, stirring to make sure all the crisp, caramelised bits are mixed into the wine. Once the wine is bubbling, stir in the redcurrant jelly. Stir until melted then add the stock. Cook over a medium heat for 10-15 minutes until bubbling and slightly thickened. Strain into a warmed jug and serve. 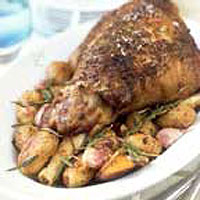 For 2-3 people, a 500g boneless leg roast is ideal (just halve the other ingredients) but will require different cooking times. Cook for 20 minutes at 230°C, gas mark 8, then 20 minutes per 500g at 200°C, gas mark 6 for medium-rare, 25 minutes for medium and 30 minutes for well done.